Hello, my name is Tyler and I am the founder of Ghostshadow Games. I speak English, Pig Latin, and am currently learning German. I started making games a few years ago, one of my firsts being Weegee Campaign '08 (I will put the download link on here soon). I am a huge fan of Valve, makers of Half-Life and Portal. Valve's founder, Gabe Newell, is the one who inspired me to start making video games. 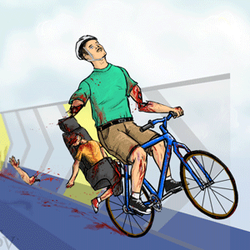 I also play the internet flash game happy wheels (link at bottom of page). The creator of that game, Jim Bonacci, also inspired me to create video games. My two favorite sports are skateboarding and parkour, I parkour when I feel like it, and used to flatland on my skateboard (I need to get a new one now). I also like American Football, my favorite team is the Oakland Raiders, and I like NASCAR, my favorite driver is Jeff Gordon. My favorite movies are Terminator 2 and The Room. I also watch the Nostalgia Critic.